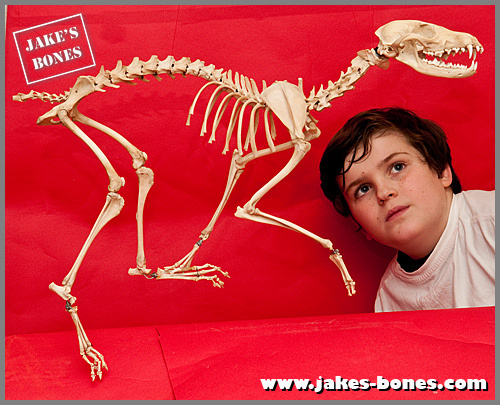 You are here: Jake's Bones > My finished rearticulated fox skeleton ! 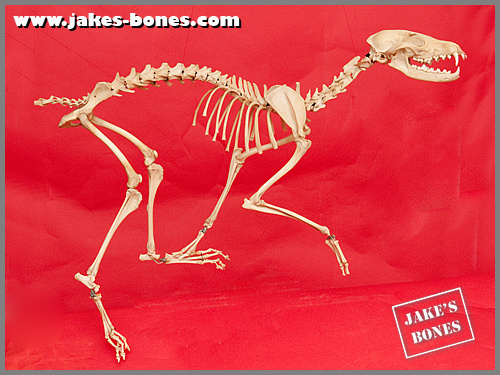 My big project for the Christmas holidays was rearticulating (putting back together) my fox skeleton Vulpy. I finally got round to finishing it two nights ago and it took AGES but now it looks amazing. When I first got Vulpy she was a present from a local gamekeeper who had shot her when she was killing lambs. So she started as a fresh body, then I buried her, left her for months, then dug her up when she was all clean. She's has been in one of my storage boxes since then but I thought she would be good to practice rearticulation on because I have almost every single bone from her. 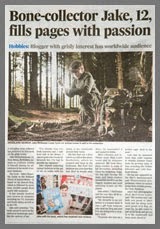 Next week I'm write about every stage of how I did it (here it is now ! ), but this week I am going to show you how she looks now she is finished. The first choice I had to make was what position she was going to be in. I looked at lots of photographs of foxes, and I liked one I from this post where the fox was pouncing, but that looked very tricky to do. Then I found this picture on Google Images which I liked. Then I had to think about how I was going to support the skeleton. I decided I didn't really want big ugly poles at each end to hold it up which would have meant all the weight would have to be through the legs. Then I had a better idea. Instead of supporting it from the bottom I could support it from the top by wires ! This also helped because my room is so full of bones I don't really have space for something with a big stand. So here it looks like it is running, but there are thin threads holding it up that if you look closely you can see. The skull was easiest to do and the first thing I did, but it went on last. 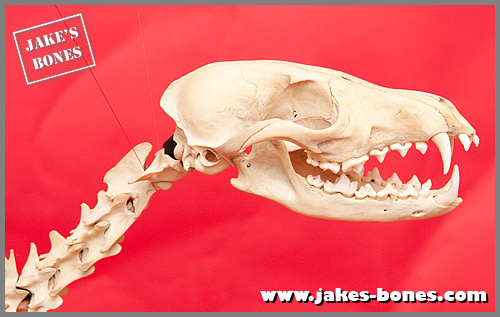 The jaws have a tiny piece of wire to hold them onto the cranium and there is a piece of wire that goes through the vertebrae up into the skull, just like a spinal column. The kneecaps are really a bit away from the knee, but I glued them onto the bottom of the femur. You can see Vulpy was young because the tops of the tibias haven't properly fused yet. There is no wire visible in this joint at all. I didn't want there to be lots of wire or glue showing. This is the back right foot. There were enough phlanges to do the back feet but not the front feet. 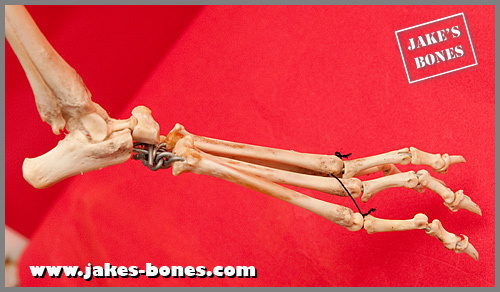 I left out most of the tiny tarsals (ankle bones) and carpals (wrist bones) which go where the bit of wire is. The black thread holds them together but isn't really needed. The long bones are the metatarsals, then come the proximal phlanges, the medial phlanges and the distal phlanges (with the claw shape). The front paws don't have the medial or distal phlanges. 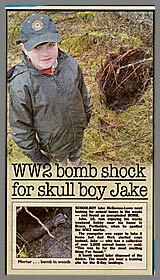 When I buried it I assumed it had a tail but it wasn't on the photos. Now I think the gamekeeper had cut it off. You can see one of the tail bones is cut in half. 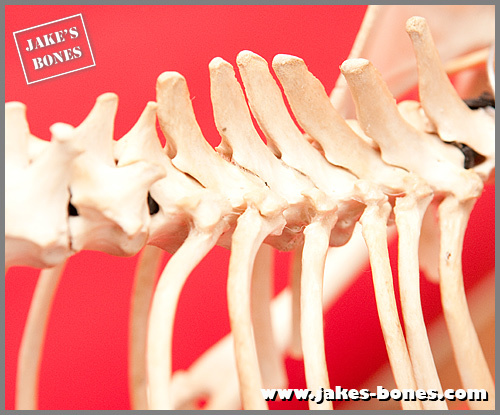 These are also called the caudal vertebrae, and are the ones after the pelvis. So Vulpy doesn't have a tail which saves some space in my room. 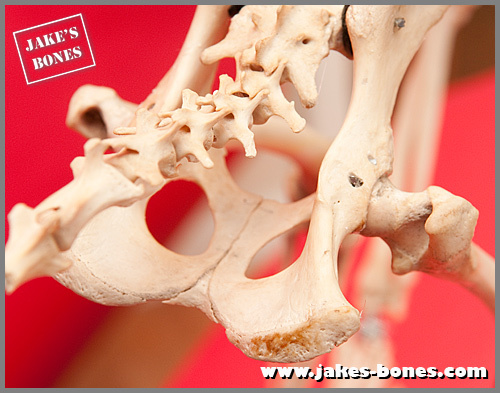 Because she was young the pelvis was in two halves and a small Y-shaped bone between them and so it had to be glued together. 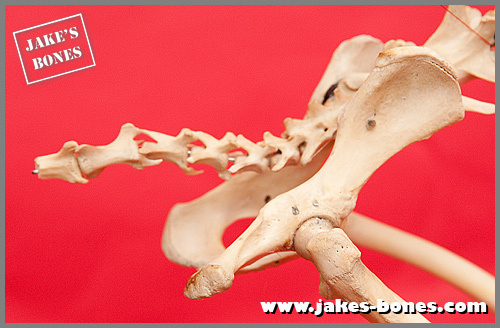 You can see the small bits of wire which hold the spine and femurs. 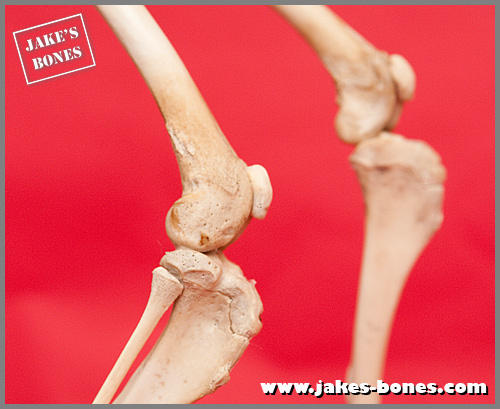 This is the elbow joint where the humerus meets the radius and ulna. I am proud of this joint because there is no glue or wire visible but it is still very strong. This is the shoulder blade. In real life this isn't connected to any other bone so it is difficult to attach. I have done it without any wire or glue visible at all, and it isn't attached to the tops of the vertebrae either ! 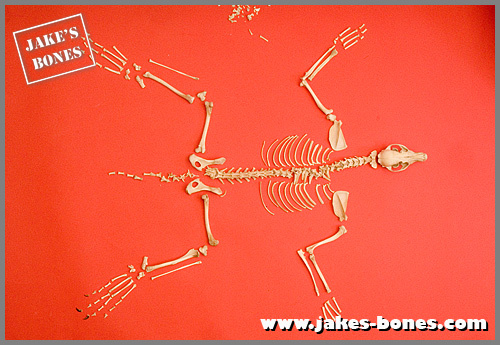 The vertebrae and spine were easy but the ribs were difficult. 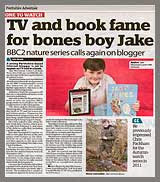 A big big thanks to Ben Garrod of Ben's Bones who helped me by email with this ! I wouldn't have been able to it without him ! Next week I am going to write about how I did every single step. (Edited: here is part one !) I might even split it into two because there is so much there ! In the meantime Vulpy is going on display in my bedroom: this is how she looks ! 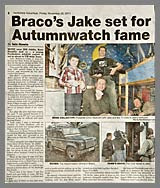 That is just SO amazing Jake. 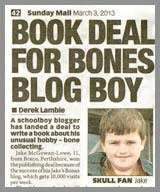 As a bone enthusiast for 40 odd years I am amazed at what you do, and the way you write about it. 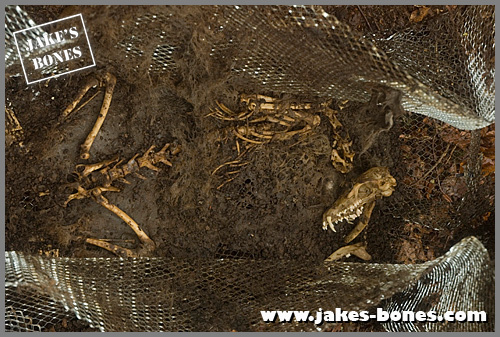 I think your site is one of the very best bones websites in the world. Let's not mince words. The VERY BEST. Can you find me a better site that explains things so clearly for a non scientific audience and has such great, detailed pictures? No! You can't! 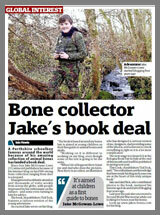 I guess the gamekeeper would cut the tail off so he could show the landowner he was doing his job effectively. 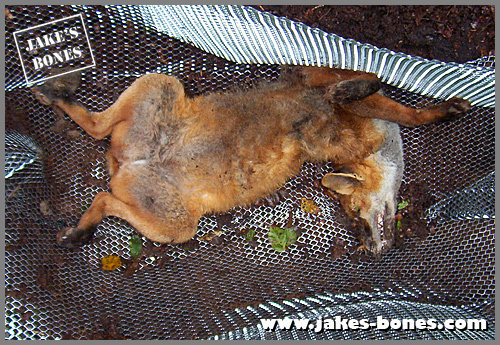 Round here they hang foxes, moles etc on fences for the same purpose. That is so cool! 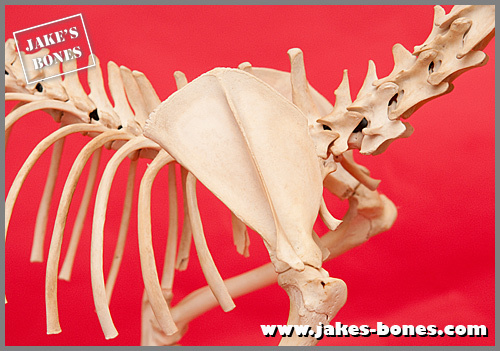 I have never done any rearticulation myself, but it would be fun to try sometime (I wouldn't mind having a cat skeleton sitting in the window :-) ). I'd love to read how you did the rearticulation. It looks like you mis-sided the scapulae and the tibiae. I think the flying mount is a lot easier and better looking. Paolo's at http://paolov.wordpress.com is very good, and Psydraches (Bones and Nature) and Julia's (Julia's Collection) are good ones too. The links are in the sidebar on the right. I hadn't noticed the tibias ! The other one was I put some of the sternum as the tail. 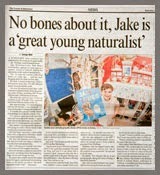 It must be very hard to put all the bones in the right order and glue them totheter so that it looks all natural. I'm very impressed by your work! I see forward to read about the step by step manual you will write. Your website is fantastic! Not only the content, but your writing and photos are great also. 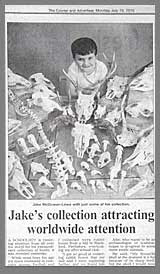 I love bones and nature/science in general too. Plus, even tho I am 42 (old!) 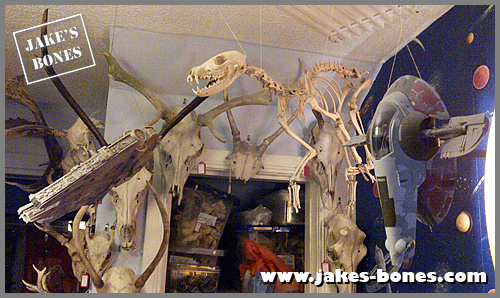 the photo of your room looks a lot like parts of my house: bones and Star Wars! Thanks for sharing your expertise. If I get more skeletons up I'll have to move the Millennium Falcon ! I am very pleased to leave my comment here. This article is quite interesting.